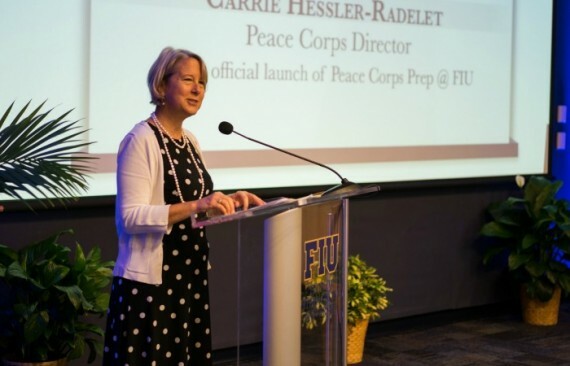 Peace Corps Director Carrie Hessler-Radelet speaks at the Oct. 10 launch of the new FIU Peace Corps Prep Program. Freshman Victoria Mendez came to FIU with the goal of ultimately joining the Peace Corps. A new program, which launched last week, will provide her the opportunity to do just that. In a new partnership with the Peace Corps national office, FIU officially launched the university’s Peace Corps Prep Program Oct. 10 with a special event in the Graham Center featuring Peace Corps Director Carrie Hessler-Radelet. The program, which will be run by FIU’s Office of Global Learning Initiatives (OGLI), is designed to prepare students like Mendez for work in international development. Mendez, an international relations and communications major, is one of 75 students already signed up for the program. Along with her peers, she will complete four global learning courses, four semesters of foreign language study, a globally focused community engagement project and a written self-reflection as part of the program. After completing the two-year program, they will be awarded the FIU Excellence in Global Learning Medallion, which offers employers and graduate schools tangible evidence of students’ enhanced global awareness, perspective and engagement. “I chose to come to FIU because I wanted to learn what it really means to be a global citizen, and I was ecstatic when I first heard about this program,” Mendez said. With 187 alumni having served and 11 alumni currently serving in the field, some of whom were on hand for the event, FIU already has a proud history with the Peace Corps and becomes one of just 25 institutions across the nation to offer this prep program. According to OGLI Director Hilary Landorf, who served in the Peace Corps from 1979-1981 in Morocco, the partnership between FIU and the Peace Corps is a natural fit. For more information about FIU’s Peace Corps Prep Program, visit their official webpage. I would like to receive information about the Corp Peace to serve in Stockolm or Costa Rica. Thanks! Having Served I can say that noting is really going to prepare people adequitly for serving in the Peace Corps. Instead of language classes (good luck covering the language they sill speak in country) tey would be better prepared by trying to think on their feet, solve problems without much in the way of resources or support and getting used to living in a complately foreign environment. I loved my time in the peace Corps, but I don’t think taking classes is really going to help. Even 50% of what Peace Corps taught us in country was useless and had to have been designed for other regions.